In my study of the Armenian Genocide debate, I have encountered many times on both the Turkish side and the Armenian side, where freedom of speech is suppressed. Article 301 of the Turkish penal code is what is always cited as one of those restrictions on freedom of speech. Indeed, Turkey must reform this law and completely remove it. Fortunately, the law is already a joke, many people who are accused of it, usually get acquitted because of the specific situations in which the law can only be applied. Turks are easily offended by accusations of the Armenian Genocide as they find it disrespectful due to the number of Turkish victims during 1915 at the hands of the Armenian Revolutionary Federation that has left a bloody stain in Turkey. Similarly, the many lives lost during the Armenian relocations have left another open wound for Armenians who are easily offended when someone denies what they believe is absolute truth: The Armenian Genocide. The Turkish government should reform their laws in order to give the maximum rights to all people. They shouldn't be provoked by anyone's attacks or criticisms verbally or in writing. The Armenian government as well needs to begin acceptance that Turks are their neighbors and that they need transparency and openness. Armenia must open its locked historical archives and let this dark chapter of history be exposed in its unfiltered form. Armenia must remove the law that bans Turkish flags in their country. Armenia must accept that some people will deny the Armenian Genocide and they have every right to. You have no special right to not to be offended. You have every right to offend anyone you want because that is what allows the free exchange of ideas and achieves progress in a society. Criticism must never be forbidden; that is how we as a society, improve. You have every right to dissent from your peers, coworkers, friends, family, and countrymen. You have the right to accept the Armenian Genocide or deny the Armenian Genocide, and do not let anyone's empty threats stop you. Do not let the threat of being labeled propagandist, denier, politically incorrect, or racist stop you. In the academic and scientific worlds, the utmost important right is the right to disagree. If we did not allow this right, we would still think the world is flat. Absolutely, this is what hurts everyone, the idea that one side can offend the other, or that one side cannot disagree with the other. I'm glad you also pointed out the restrictions on freedom of speech in both Turkey and Armenia. I think the United States is the best bastion of free speech and rights. This is what makes the US such a great place to create new ideas. Everyone must accept that ideas are not the enemy. Thanks for this great article Dr. O'Connor. Unbelievably, in one strange case, I was told by an Armenian that I must be paid for "spreading lies" and that I am "immoral" for disagreeing with him about the Armenian genocide. There is nothing immoral about speaking your opinions or in my case, researched facts. It's sickening to hear people condemn or label you for what you believe or discover. Like when Copernicus discovered that the planets including Earth revolved around the Sun and people tried to silence him. I agree, we have to be open to all sorts of views and ideas, no matter how much it may be opposite to our beliefs. That is important for an open society. Happy 4th of July everyone. I really appreciate your effort and I really enjoy with reading your articles.I suppose that most of the writers are from academic institutions.I just have one question.Why isnt Turkish side supported as much as Armenians?Why cant we see people like you in public opinion?Only thing we see is Armenian historians(!) who vilify Turks, even though Armenian thesis is still open to discussion.It is not fair at all. There are an arsenal of reasons why there are less people publicly defending the Turkish side, then there are accusing the Turks of genocide. 1) Very few historians, who are not Turkish or Arabic, study the Ottoman Empire. As a result the number of Ottoman historians is limited to those who are Turkish or Arabic--making their credibility more difficult to establish. 2) There are plenty of Armenians who may have immigrated to America or have been in America for generations... Who still have nationalistic tendencies, but studied history and are able to write books and study Armenian history. As a result, there are plenty of Armenian historians promoting Armenian research using Armenian sources (as a result they blame Turkey for genocide). 3) Due to the persistent denial of the Holocaust, by those who are neo-nazis who denied the Holocaust became associated as genocide deniers, and the Armenians use this to label those who deny the Armenian Genocide--even though the Armenian Genocide has no proof and the Holocaust has been proven countless times. Thus, it is difficult and discouraging for historians to put their reputation on the line by entering this debate. However, AGD has become a great source where historians are free to speak their minds. 4) Fear. Some people are afraid nationalists and activists will harass them or attack them for their research, so instead of writing about Ottoman history, they write about something less debated and heated. The fear is valid because a few historians have been attacked and even their house was bombed for their opinions on historical subjects regarding the Armenian Genocide. 5) Money. There's plenty of money by Armenian organizations to promote the Armenian Genocide. 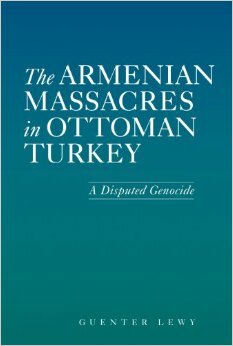 There's no money in denying the Armenian Genocide, except by selling books (which don't sell as much because large populations of Armenians buy a lot of books promoting the Armenian Genocide, not ones that deny it). This is also why I don't spend much time on this site, it doesn't make me any money to do this. I have much more important historical research that does produce money.